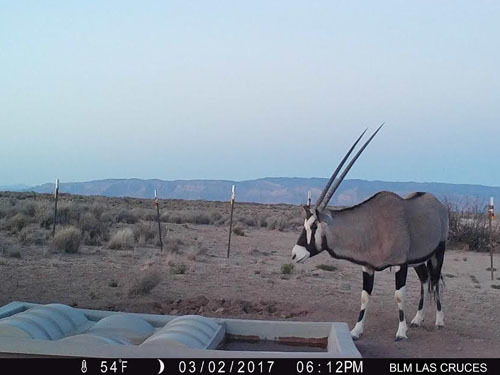 This guzzler is located on McGregor Range which encompasses over 606,000 acres of co-managed by BLM and the US Army (Ft. Bliss) in south-central New Mexico. The BLM manages the natural resources and the Army uses the area as an active training area. The reflective posts you see in the background are in place to warn soldiers of the guzzler's location so they can avoid driving tanks or other military vehicles over the guzzler. 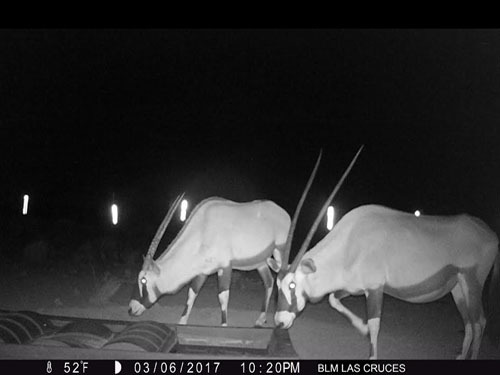 These oryx or gemsbok were introduced from Africa to the White Sands Missile Range in the 1960s by the New Mexico Department of Game and Fish to provide a unique hunting opportunity in the state. They have since expanded their range throughout southern New Mexico and into far west Texas.